American Lake is currently a 9-hole golf course, and Nicklaus’ golf course architecture company, Nicklaus Design, has donated his design services for the expansion project. When complete, the layout will be a one-of-a-kind 18-hole course geared specifically for disabled golfers. 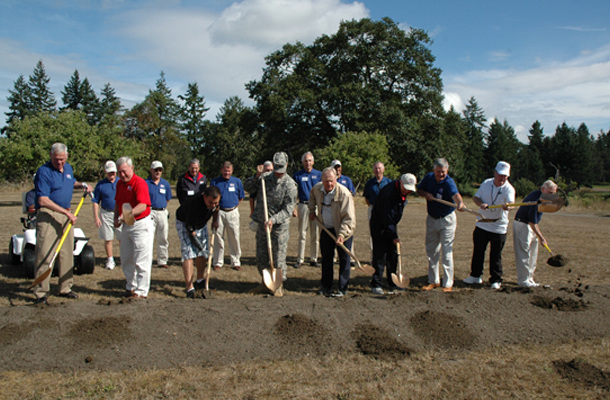 Along with Nicklaus, on hand for the ceremony was Washington Governor Jay Inslee; Jim Sims, president of the Friends of American Lake Veterans GC, which organizes the volunteers who maintain the course; Don Anderson, mayor of Lakewood; Michael Murphy, director of American Lake Veterans Hospital; SSGT Leroy Petry, Medal of Honor recipient; and PGA Professional Ken Still. It was Still, a native of Tacoma, who was instrumental in getting Nicklaus involved in the American Lake project. Still and Nicklaus have been friends since their days on the PGA Tour, and were teammates on the 1969 U.S. Ryder Cup team, held that year at Royal Birkdale and famous for Nicklaus’ sportsmanlike concession of the final putt to Great Britain’s Tony Jacklin.